In a New York City premier, Mick Taussig and Helene Baril will perform their multimedia collaboration, The Sea Theater: You Might Become a Shark or an Octopus, followed by a discussion. The event is free and open to the public. 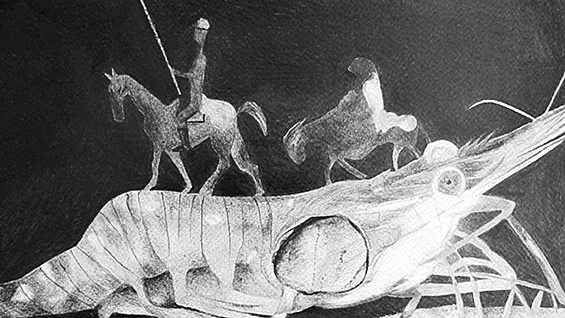 Using spoken word, music and illustration, The Sea Theater explores the changing meaning of the sea using elements of Don Quixote, the philosophy of Frederich Nietzche and dreamspace. Mick Tussig, a culturual anthropologist, performs the words and music while Helene Baril provides the fantastical projected illustrations. So let us explore the possibilities for human transformation due to the changed meaning of the sea by setting up a conversation with Nietzsche’s obsession with the sun setting in a blaze of fire, together with his idea of a “reverse experiment” in which the human becomes marine, as we see with humor and wonder in Jean Painleve’s 1920s underwater films. Begun as a re-imaging of Don Quixote and Sancho Panza off the Finnish coast, The Sea Theater is inspired by the novel Das Totenschiff (The Death Ship), written by the German-Mexican anarchist B. Traven, in which the ship tells the best stories, inanimate things become animate and, for a brief moment, we achieve the mastery of non-mastery. The Sea Theater was first presented in March 2014 in Akademie Schloss Solitude, Stuttgart. The Sea Theater is an extension of The Sun Theater presented in Berlin and New York in early 2013. Mick Taussig is one of the most innovative, distinguished, and socially engaged voices in cultural anthropology. An interdisciplinary thinker and engaging writer, his work combines aspects of ethnography, story-telling, and social theory. He is Professor of Anthropology at Columbia University, and has lectured at universities, conferences, and cultural institutions around the world, and has received numerous honors. Publications include include What Color Is the Sacred? (Chicago: University of Chicago Press, 2009); Law in a Lawless Land (New York: New Press, 2003); Defacement: Public Secrecy and the Labor of the Negative (Stanford: Stanford University Press, 1999); The Magic of the State (New York: Routledge, 1997); Mimesis and Alterity (New York: Routledge, 1993); The Nervous System (New York: Routledge, 1992); Shamanism, Colonialism, and the Wild Man (Chicago: University of Chicago Press, 1987); and The Devil and Commodity Fetishism in South America (Chapel Hill: University of North Carolina Press, 1980), and most recently, a book on drawings in anthropological fieldwork notebooks. In addition, he served as advisor and participated with writing for Documenta 13. Helene Baril was born in 1978 in France. She is a painter of houses and cars. Her idea of painting is to fuse and confuse the menial house painter meaning of painting with the fine arts meaning of painting. In 2011 she received the Arteles Artist of the Year Award. In 2012 she founded the platform SBK, an autonomous and poetic organization. This event is presented as part of the Interdisciplinary Seminar, created as a discussion series on artistic practice for the students of the Cooper Union School of Art and the creative community that surrounds them. All IDS events are free and open to the public. The Interdisciplinary Seminar is part of the Robert Lehman Visiting Artist Program at The Cooper Union. We are grateful for major funding support from the Robert Lehman Foundation.